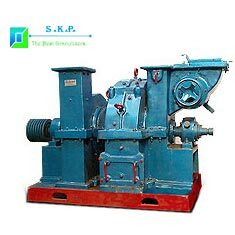 The Industrial Pulverizer is a high swing type grinding mill in which pulverization is completed by the impact of the grinding chamber. The Industrial Pulverizer is perfect for grinding non-abrasive soft, medium and hard minerals. The Industrial Pulverizer also grinds gram-dal tamarind seed. All spare parts of Industrial Pulverizer are standard and available easily. The fine Powder is swept by the blower suction from the grinding chamber via whizzer cone. The function of whizzer cone is to check the oversize particles and thus to regulate fineness sand is separated out from material from the grinding chamber by a special arrangement at an extra cost. The blower delivers the pulverized powder in the cyclone air separator. The powder is discharged from the cyclone spout. The separated air returns to the grinding chamber to complete the air circle. The excess air is bled off through dust collector filter bags. The extra fines are collected there. The main body of the grinding chamber whizzer chamber and the blower are made of heavy duty cast iron every portion, which comes in contact with the materials, is lined with heavy duty steel plates. The striking face of the grinding chamber is lined with hard iron replaceable plates. Thus protecting the machine from wear and ensuring it for long life. The grinding chamber is provided with a pocket in which small pieces of iron nuts and bolts are trapped. The main drive shaft is run on two double row self aligning heavy duty Ball or Roller Bearings.